Life According to Steph: Breakfast Burritos. Ole. Sometimes I look at my calendar and see very little time for food prep. So I need to make adjustments. One of those adjustments is using a weekend where I have more time to do some make ahead meals I can freeze. For breakfast, my favorite freezable option is the breakfast burrito. They're super simple and customizable. 1 pound ground meat - pork sausage, ground beef/chicken/turkey. Brown meat until cooked through. Drain and set aside. Beat eggs well and add spices. Pour into greased, warm non-stick pan and scramble. Add diced green chiles about halfway through. When eggs have reached desired consistency, set aside to cool. Lay tortillas out on clean surface. Lay down a little cheese, top with some egg, add some sausage, bam. Roll up into a burrito and secure in plastic wrap. Continue until the egg mixture is gone. 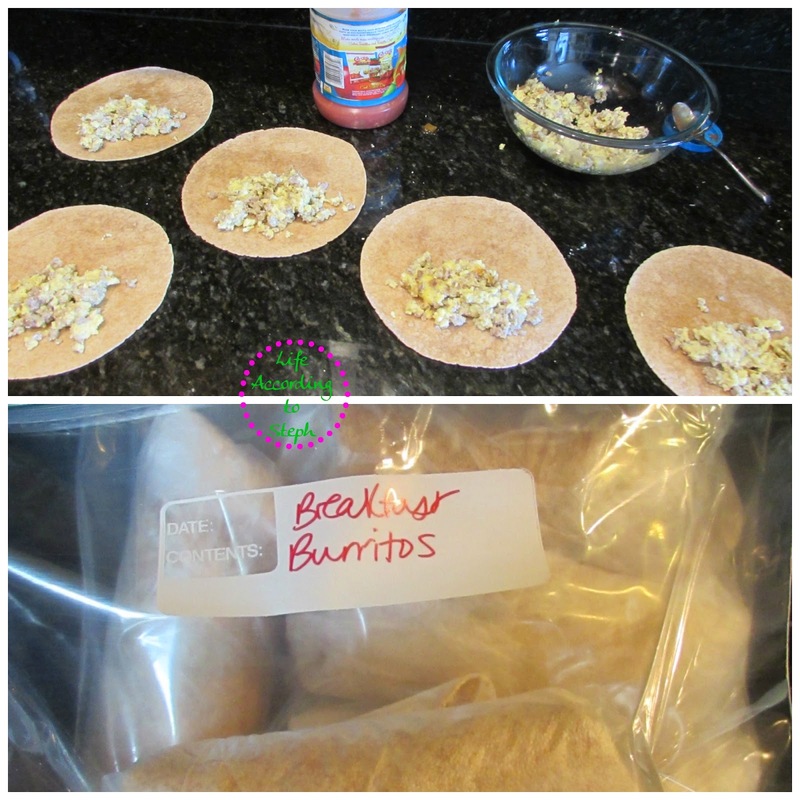 Stack wrapped burritos in a gallon-size freezer bag and freeze. To prepare, unwrap burrito and place on microwave safe plate with the folded side down. Heat in microwave for 30-45 seconds, flip over, and heat for another 30-45 seconds. Eggs are a good start. So is winning the lotto. Oh, the lottery. May we all win it. Eggs are great! We need that protein in the morning. ahhh, you got recipage to work! yay! I make these every once in awhile, but usually just for Scott and/or if we have company. I froze some once and then definitely forgot about them. I have never really made ahead meals and frozen them, but I love the idea. This looks delicious!! Yes to anything that combines Mexican and breakfast food! Making the burritos ahead of time is such a great idea. I do it all the time with extra pancakes, but I never thought of doing it with egg dishes. If Jimmy Dean can do it, so can I. Thanks for the great idea. I would love to be able to make a bunch and freeze them. I'm going to have to see when I can do this and try it out!! Those look yummy! That's great that you are so organized with your meal planning. I wish I could get my act together and start so I'm not just grabbing a NutriGrain Bar. A good friend of mine, Lane at supperforasteal.com, has a few make ahead breakfasts like this on her site. I make egg muffins a lot and freeze but these burritos look wayyyy good (also, I am sort of over the egg muffins, lol), so I need to try some variation for sure! Ummm this is just plain brilliant. yum. Can you come live withme and be my chef? Seriously, you are amazing. Steve and I had your beef barley veggie soup for dinner last night, and it was perfect and filling and hearty and delicious. We plan on having leftovers for our snow day lunch with some crusty bread! I love breakfast burritos especially ones that are super easy like that to grab and go in the morning! Thanks for sharing! That is a great idea!! 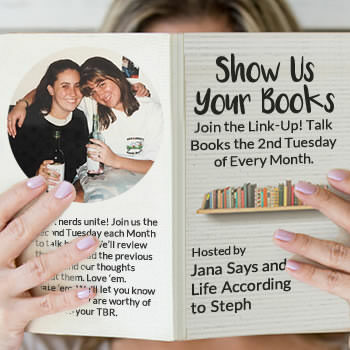 I also need to learn how to make printable recipe cards for my blog. Still haven't managed it lol! I love freezer burritos. I usually make a lunch option with beans and quinoa. It's seriously so easy! I've been meaning to try doing something like this and prepping my breakfasts for the week other than boiled eggs. looks good! I can't eat burritos, womp womp - but I have been wanting to try these for KC. I've seen ones that have black beans in them, but I'm too scared to try in case they turn out bad. Might have to make these ones first! and yay for printable recipes! OMG, that haiku. I think it's one of my favorites you've done. I love a good breakfast burrito. I typically use eggs, peppers, onions, cheese, and bacon. So delicious. I think I need to make some this weekend. Anyways, breakfast burritos sound so fun and easy! I am on this kick where I hate eggs right now though, so I will pin this and come back when I can stomach them again. Minus the spinach, they are delicious! I love them for dinner too! Everyone can spice it up their own way! Great recipe! 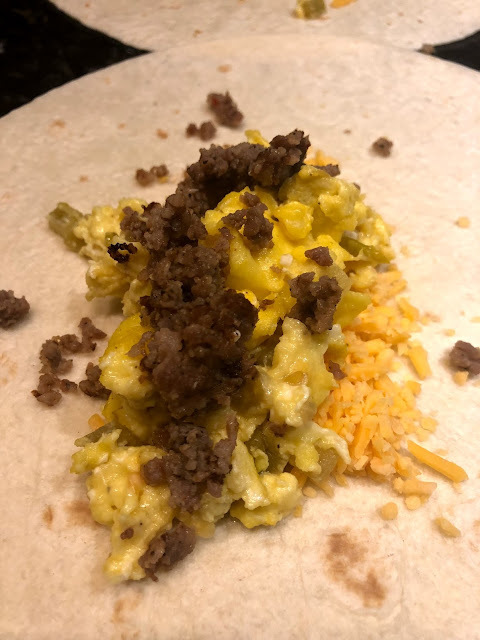 Being from Texas, breakfast burritos are a huge thing and definitely my favorite make-ahead breakfast. I love this. This would be wonderful to have in my freezer for kids breakfast too. Grab and go on the way to the bus! I need that printable recipe jazz too. Love it! I used to make and freeze breakfast burritos all the time!! I might have to get back into it. It's so easy to just grab and go!! This is borderline brilliant!! They look so tasty and I love that it's something you can make ahead! Oh man this looks yummy! I feel like I say that on all your food posts but its so true! How long do you think these could freeze for?